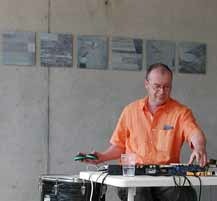 Living in Switzerland since 1966, percussionist Günter Müller has been playing a unique drum set with a mobile pick-up and microphone system of his own invention since 1981. The system allows hand-generated sounds on drums and percussion to be modulated electronically. Since 1998 minidiscs, later an ipod are included in his electronic set. He has played and recorded with a large number of fine musicians, from Jim O'Rourke to Christian Marclay, from Butch Morris to Otomo Yoshihide. Müller plays solo, and now and then in various combinations - often in duo - with Taku Sugimoto, Jason Kahn, Steinbrüchel, Norbert Möslang, Toshimaru Nakamura, Tomas korber, Lê Quan Ninh, Keith Rowe, ErikM, Carlos Zíngaro, Sachiko M, Michel Doneda, Fabrice Charles, u.o. In 1990, he founded the independent record label FOR 4 EARS records.